The ▀Pz.Kpfw. KV-IB 756(r) is a premium Rank III German heavy tank with a battle rating of 5.0 (AB/RB/SB). It was introduced in Update 1.43. It features a heavily modified KV-1 heavy tank, with the most glaring change with the gun from the 76.2 mm Soviet gun into the 7.5 cm KwK 40 gun, giving the KV-1 a very noticeable improvement in firepower against enemy tanks. 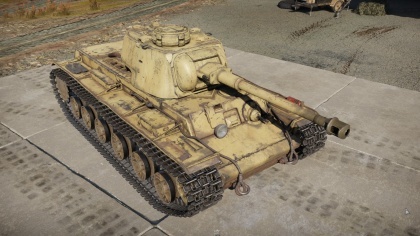 The KV-1B 756(r)'s German made 75mm KwK40 gun is a solid gun. The main gun is a 75 mm German KwK 40 with barrel length L/48. Available are 4 different ammunition types: APCBC, APCR, HEAT and HE. As a decently long German gun it features very good accuracy and muzzle velocity: from 990m/s for APCR to 450m/s for HEAT. The reload time in game is 7.6s which means that you can fire almost 8 rounds per minute. The guns strength are long-range engagements and it is especially good to use in BR 4.7, where you will face many easy to penetrate medium tanks. In higher ranks it will have a superior fire rate then most higher caliber guns. AP ammo has decent armour penetration and APCR will penetrate the frontal armour of anything up to around 500m with the exception of the Sherman Jumbo. It has the same accuracy characteristics as any German made gun – it will hit the target dead center. The shells wills fly in a nice flat trajectory making aiming easier in RB and SB. The gun has a diameter of 75mm which will cause a moderate amount of damage with APCBC ammo. It will most likely take two to four shots of APCBC shells to knock out the crew, depending on the enemy tank. The fire rate is around 7.5 rounds per minute depending how well the loader is trained. The total ammo capacity is 80 rounds. It's recommended to carry around 60 rounds of APCBC, 15-20 APCR and a couple of HE rounds. HEAT rounds sound good in theory, it retains its penetration over any distance, but the arching trajectory and low velocity makes it impossible to hit moving or even stationary vehicles at a great distances. 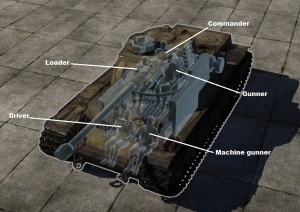 There are four ammo racks in total: two on the sides of the turret (5 rounds each), one to the right of the driver (18 rounds) and the largest directly below the turret. The chance of an ammo explosion from a hit to the front is slim however if hit at the side and low there will most likely be an explosion. The only real way to reduce the risk of an ammo explosion is to take out 10 shells so that the two ammo rack in the turret will be empty. The armour is fantastic. The front hull armour is up to 100mm thick, slopped at 30 degrees, which is on par with a Tiger's armour. If the hull is angled correctly (around 40 degrees) that number can increase up to 145mm. With that kind of armour the only tanks that can penetrate the KV-1B 756(r) are the Panther, IS-2 and Panzer IV/70(V) with AP ammo. There are several more tanks that can shoot APCR rounds and successfully penetrate the tank. The side also has additional protection because of the wheels and tracks adding a good amount of protection. All that said the KV-1b 756(r) has its drawbacks. The front hull has several weak points which are protected by 75mm of armour, penetrable by most enemy AP shells. The turrets mantle and surrounding armour is only 50mm and it's not slopped making it extremely easy to penetrate. If the side is exposed there is a high likelihood that the fuel tanks or the ammo rack will explode from a direct impact. When the tank is stationary always angle the tanks hull when facing an emeny. When reloading the gun swing the turret to the side so that the mantle is protected by the strong side armour. The tank's mobility is serviceable at best. It has a decent top speed but off-road the tank will slow down to a crawl. The acceleration is poor and a lot of speed is lost when turning. Taking long routes to the objective is not recommended because It will simply take too much time. Flanking and maneuvering is next to impossible. Reverse speed is very sluggish as well. Because the tank is so inherently slow it’s best to avoid hills, slopes and mud. The KV-1B 756(r) can be effective in close quarters but always be one step back from the front to avoid being flanked by faster tanks. Going into a wide open area can be very dangerous, If the enemy has any cover that they can shoot from a good distance it's better not to go out. On the other hand if there isn't any cover going out in the open can be the right thing to do considering that the KV-1B 756(r) exceeds in long range combat. All in all the KV-1B 756(r) has a good gun, strong amour but lacks in speed. It’s best to be at a distance and try to snipe enemy tanks. Be mindful of the weak spots on the front hull and the mantle. Do not expose the side of the tank because of the fear or a fuel and/or ammo explosion. When met with an enemy tank angle your own hull for extra protection and when reloading turn the turret to the side to protect the mantle. Don’t move around much or perform flanking maneuvers, the KV-1B 756(r) isn’t a medium tank. Be cautious when driving around in towns or any other close quarters locations. The front hull is 75 mm thick, but an extra 25 mm armour is welded onto that plate, increasing its armour thickness. Turret ring is protected by 25 mm thick armour at front and sides. 105 mm cast armour are present above and below the 50 mm gun mantlet. Firstly it's a good idea to close the distance. The tough armour is even tougher to penetrate at long ranges and for some tanks out right impossible. If there is no other choice try shooting for the mantle. It's not going to be easy to hit it considering the area is small and most likely shells will frustratingly bounce of the gun of the KV-1B 756(r). When up close there are multiple places on the tank where massive damage can be dealt. 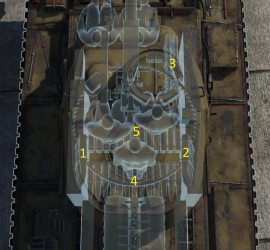 When facing the front of the KV-1B 756(r) there are 3 distinct weakspots: the drivers view port, the hull machine gunners port and the mantle of the gun. Most tanks shouldn't have a problem penetrating these spots with AP ammunition. Coming up at the side there is a chance to shoot one of the ammo racks to explode the tank in one graceful shot. The ammo racks are located directly below the turret and just above the lower wheels, directly to the right of the driver and on either side of the turret. The turrets side and back armour is uniform thickness and it can be pretty tough to penetrate it when its angled. 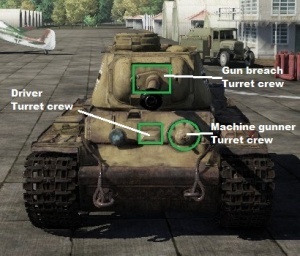 It's best to simple aim just below the turret and shoot the the hull (note that there is a small strip or additional 25mm armour just below the turret so avoid shooting that spot) to knock out the crew in the turret. Also watch out for the track and wheels on the side, they can add enough armour to negate any damge. When firing at the back of the tank it's best to shoot the turret because there aren't any fuel tanks near the engine. 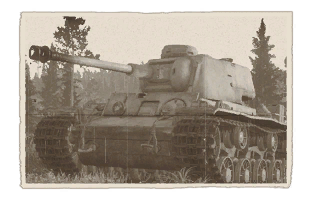 There isn't much use of taking out the engine because of the fact that the KV-1B 756(r) is inherently slow and most likely won't run away. PzGr 39 - Armour Piercing Ballistic Cap shell - This is your main ammo type, always use this if you think it can penetrate enemy armour. It deals the most damage because of its explosive filler. PzGr 40 - Armour Piercing Composite Rigid shell - It is highly advised to take at least 15-20 of these rounds. The shell has enough penetration to deal with any tank (except the Sherman Jumbo) from the front up to 500m but lacks the necessary damage. Use this shell to exploit weaknesses in the enemies tank by targeting ammunition racks, fuel tanks, the engine and any other weak points. When facing slopped armour at or close to 60 degrees use APCBC. It's best used against Panthers, Tigers, IS tanks and SU-85Ms. Has a good flat flying trajectory. Hl.Gr. 38B - Cumulative Anti-armour shell - it is recommended to completely avoid this kind of shell as its performance is vastly inferior in all aspects compared to APCBC or APCR ammo used by this tank. SprGr. 34 - High Explosive shell - You should carry only very few of these. They are useless against anything other than unarmoured AA vehicles, to which it is lethal. Ammo racks of the KV-1B. Well armoured to resist most shells against its typical enemy. Somehow more mobile and faster than the regular KV-1. APCR shell can penetrate even the heaviest foes. Rear transmission means frontal hits is unlikely to damage component and render tank immobile. Since it is based on a "Russian" tank, you can trick some enemies into thinking you're a friendly in SB battles. However, a skilled opponent will know. 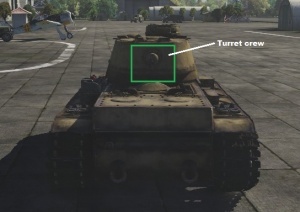 Cupola on turret top is very prominent and can compromise position or even be hit. The sides are lined with fuel tanks, high chance of fire or fuel explosion. Concentrated ammo rack at the hull bottom, low side shots have a high chance of striking and causing an ammo rack detonation. Small turret space, a single shot can knock out every turret crew member. Poor turning ability, turning will bleed speed very quickly. Slow reverse of -5 km/h. Since it is based on a "Russian" tank, unknowing teammates may shoot/destroy you in SB battles. The appearance of the KV-1 during the German invasion of Soviet Union came as a huge surprise to them. No German anti-tank weapon bar the 88 mm cannons was able to defeat the KV-1. However, as the war progressed and Germany began to build better tank and anti-tank guns in response to the KV-1 and T-34s. The Soviets in turn also did a few changes to the KV-1s in order to adapt them to the changing battlegrounds, but they were eventually phased out by the newer IS heavy tank series. During the battles that raged on the Eastern Front, a few KV-1s were captured by the German due to the crew abandoning them from mechanical failures or combat damages. The Germans recovered and repaired these tanks, and used them against their former users under their designation as the Pz.Kpfw. KV-1A 753(r) for the 1941 model (KV-1B) and the Pz.Kpfw. KV-1B 755(r) for the 1942 model (KV-1C). 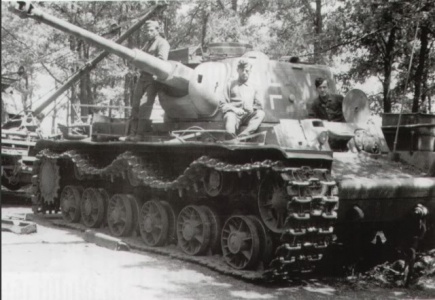 While these tanks were adequate for German usage, a decision was to modify the captured KV-1 tanks for better efficiency with better guns and armour. This modified tank was to be designated the Pz.Kpfw. KV-1B 756(r) and was based on KV-1C model with applique armour and a cast turret. The first major change to the vehicle was the removal of the old 76.2 mm gun with the 75 mm KwK 40 seen on the newer Panzer IVs on a new mantlet design derived from the Ausf. G model. The commander's cupola on the KV-1 was also replaced with the Panzer IV's with the two-part hatch. The ventilator on the turret was taken from a T-34 and installed, and utility baskets were added on the rear deck of the tank. Only one KV-1 saw this change into the KV-1B 765(r), though it arguably gave the KV-1 a much better firepower advantage from the older 76.2mm cannon. This KV-1 was attached to the 204th Panzer Regiment, a part of the 22nd Panzer Division, and saw action in the Battle of Kursk in 1943. Today, its fate is unknown, but it is presumed to have been destroyed in the heavy fighting. Skins and camouflages for the KV-1B 756(r) from live.warthunder.com. This page was last edited on 14 March 2019, at 21:09.